Welcome to my latest “brand book bite” — check out the full collection of write-ups and author interviews here. the best bits: Evolve starts with the premise “The future of marketing is riddled with new capabilities, which, in turn, creates new challenges” and dissects changes such as how direct marketing has evolved from a discrete print-based tactic to an omni-channel discipline executed across a range of media and how retail has become more personal, local, and relational. the brand story: Remember Columbia House, the subscription-based direct mail “club” that would offer “13 CDs for a Penny” and hook you into receiving the “selection of the month” in perpetuity unless you canceled your subscription? Evolve provides a case study of how Columbia House used community efforts to turn around its brand. To combat the impassioned complaints from members who used social media to air their grievances against the company, Columbia House first audited the social conversations about its brand. Then it took to the social airwaves to engage people in conversations about the changes it was making to its business and to ask them for honest opinions and questions. One marketing manager started personally troubleshooting long-standing customer complaints and address the problems raised in online forums. He then crowd-sourced the specs of the promotional program that the company would use to launch the new CH brand and, as soon as it the promo was posted, orders started pouring in. Eventually brand advocates also started speaking out about CH. This story serves as proof of how targeting the right communities with transparency and value can develop sustainable customer relationships with profitable results. the bottom line: Because Evolve is a collection of thought-pieces, it doesn’t read like a cohesive, linear text. Therefore I recommend you flip through it and when a particular headline or transition header jumps out at you, stop to read that section. 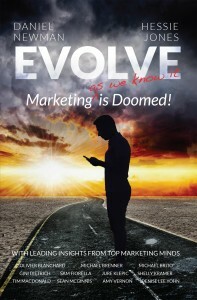 And don’t be put off what seems to be an overly sensational and somewhat negative book title — the book provides a balanced analysis of what has changed, what hasn’t, and how marketers should — and can — respond.